Biodiversity is all the plants and animals around us. Maintaining the variety of different species is vital in supporting life. Protecting biodiversity is a challenge in a growing city like Darwin. We are home to a variety of plants, animals and insects (more than most other major cities in Australia). As existing habitats are placed under increasing pressure from climate change and urban development we need to realise the importance of pockets of native vegetation such as East Point Reserve. East Point has been surveyed for the species present, with a comprehensive flora and fauna report of this site being conducted in 2013, from this a Biodiversity Management Plan was produced that helps guide activities undertaken at the Reserve. Wildlife is present despite the effects of urbanisation, many species persist. We need to appreciate how special that makes the place we live. The great thing about birds is you can pretty much find them anywhere in Darwin! Each species has special adaptations to help them survive in particular habitats, like Darwin’s mangroves, woodland forests, or on our coastal beaches. Darwin is home to a variety of unique birds. Our tropical climate means we get species which only live right here such as the Lemon-bellied Flycatcher and the Crimson Finch. Darwin is so close to Asia we also have cool migratory birds that come and visit during certain months of the year. Migratory shorebirds as the name suggests are birds which can be found on the shorelines and beaches. In Darwin we can see these threatened birds at places like Nightcliff foreshore and East Point Reserve. Shorebirds are very small, but they, make an incredible journey of over 20,000 kilometre each year, flying between their breeding grounds in the Artic to here in Darwin. That’s an amazing trip for these birds (some smaller than the size of a chocolate bar!). When they are here in Australia they need rest and lots of food. So it’s important we don’t let our pets chase them or disturb them too much when we go walking along the beach. 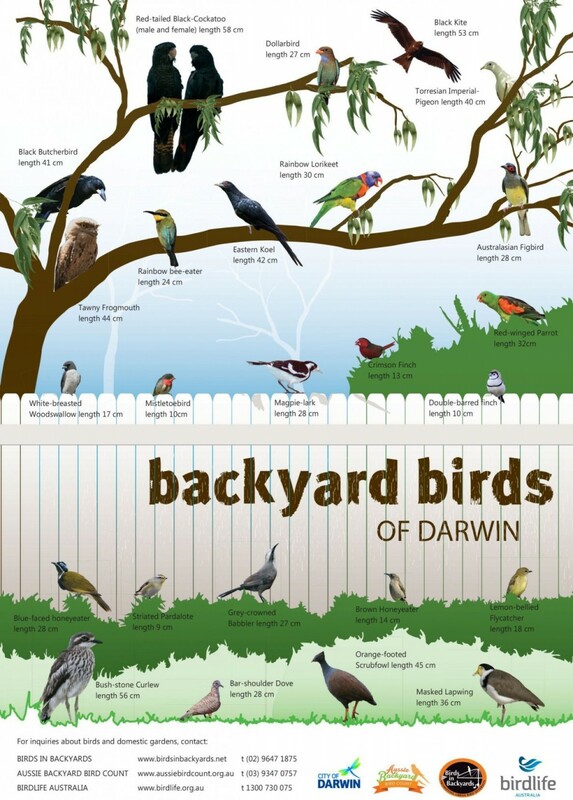 Use this poster to find some of the birds you will see around Darwin. If we don’t work to save our wildlife we could easily lose many species that are crucial to our environment and economy through tourism. There are 48 nationally listed threatened species and over 80 Territory-listed threatened species in the Top End including many shorebirds the Black-footed Tree-rat, Atlas Moth and the Floodplain Monitor all of which we are actively trying to support through maintaining and improving habitat areas. With native wildlife all around us if you come across any injured or orphaned native wildlife contact Wildcare NT for assistance. Everyone loves living in our green tropical city, local vegetation plays a big part in making the city so beautiful. To keep our city green we prefer planting locally native plants in all our parks, gardens and roadsides. Check out Gardens for Wildlife program to build and create a wildlife habitat in your garden. The urban forest including Council owned, private parks and gardens have many benefits encompassing improved air quality, shade, temperature reduction, linking wildlife corridors as well as general aesthetic values. For some ideas on how you can create habitat and what to plant at your place, our creating Habitat booklets is a useful place to start. The booklet identifies which species are suitable and unsuitable for planting on verges as some species grow too tall and interfere with power lines causing safety and maintenance issues for Council and utility providers.